The homeless may face more financial challenges in securing permanent affordable housing in Kendall County than in any other metropolitan area in Illinois, according to a recent statewide study. The average rent for a two-bedroom apartment in Illinois is $977, said Bob Palmer, policy director for Housing Action Illinois, which conducted the study. In Kendall County, however, that projected housing wage rises to $22.52 per hour, the highest of 15 metropolitan areas in the state, the study, entitled “Out of Reach,” found. A Kendall worker making the state minimum wage of $8.25 per hour would have to work 93 hours in a week to afford a two-bedroom apartment in the county. Kendall County Public Action to Deliver Shelter (PADS) is sensitive to the often out-of-reach housing costs in the community, said Anne Engelhardt, executive director of the nonprofit agency. That’s why Kendall County PADS is committed to another season of providing temporary, safe shelter and nourishing food to the men, women, and children within the county who are homeless or just in need, Engelhardt said. From Oct. 18, 2015, through April 16, 2016, Kendall County PADS will provide homeless shelters from 7 p.m. to 7 a.m. And once again, seven churches have graciously offered to host PADS guests at the following sites. PADS Director Anne Engelhardt talks with host Barb Nadeau about the upcoming PADS season and how volunteers can help. Listen to clips or listen to the entire program. With statistics like these, it’s no surprise that many men, women and children in Kendall County are struggling to keep their homes and apartments. With winter right around the corner, the need to serve our county’s homeless has never been greater. If you’re facing homelessness, we want to help. If you’re considering volunteering, please contact us. We need more than 500 volunteers each PADS “season”, to effectively serve the county’s homeless from October through April. Right now, we’re training volunteers, equipping facilities, and praying that God touches the hearts of volunteers across the county and beyond. We’ve redesigned our website to serve both guests and volunteers better. We welcome your feedback and look forward to working with you to better serve our guests this season. 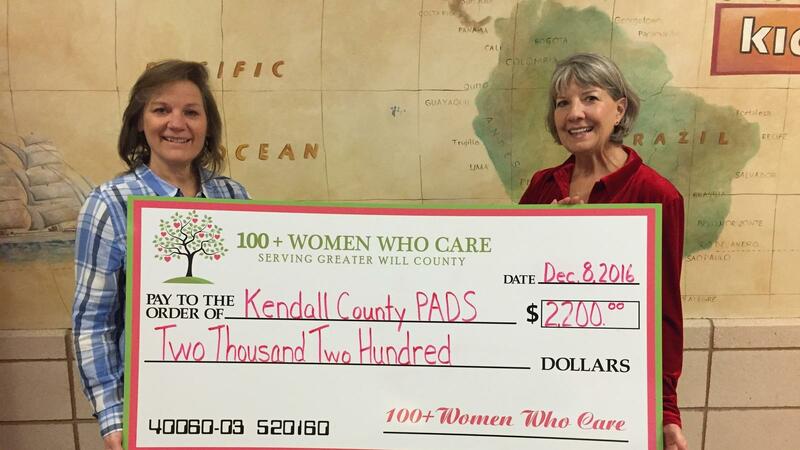 Karen Allred, of 100+ Women Who Care of Greater Will County, and Anne Engelhardt, Kendall County PADS executive director, display blowup of check that the philanthropic group recently gave the homeless organization. PADS sincerely appreciates its volunteers! The donation of your time (2-3 hours per month), provide hope to the homeless.